A healthy salad recipes that has a great balance of sour, sweet and crunchy. This fresh and colorful salad is best with grilled chicken / baked chicken or can be served as main course. It is one of the best salad recipes that even picky eaters will finish off. 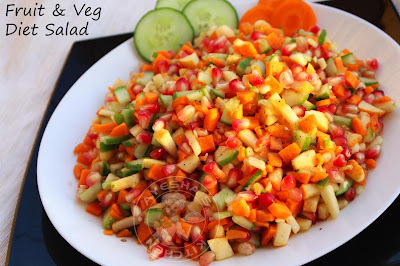 Most of us love to have carrot and cucumber salad recipes with simple salad dressings. 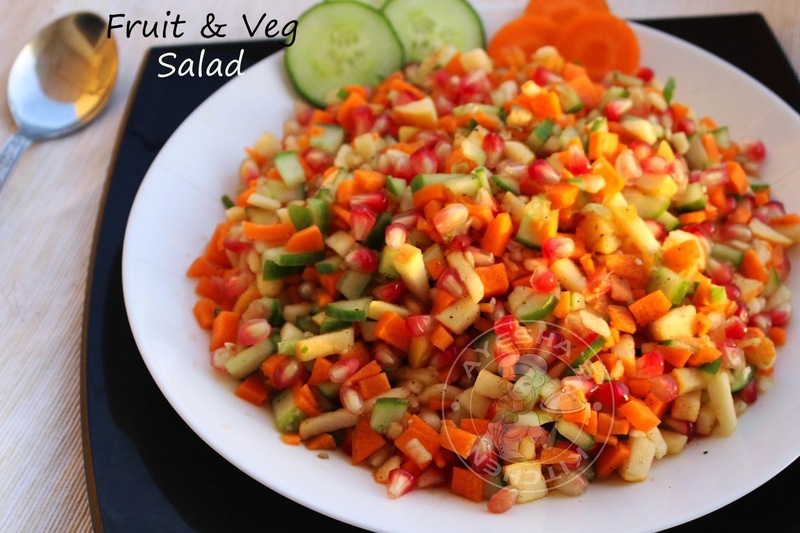 This recipe for vegetable and fruit salad is served with apple cider vinegar and some seasoning. Apple cider vinegar is the most popular vinegar that can help you to reduce weight. Consuming apple cider vinegar in salads can help you feel your tummy full and this makes you to eat less. Its benefits are more concerned with health. So its best to use this vinegar instead of normal white vinegar in this salad. This full of flavor and easy salad is ready in a flash that can be made ahead of time also. All you need is just shake the ingredients together and store in fridge until ready to serve. Give it a final shake , check for additional seasoning if required and then garnish to make it attractive. Will soon get back to you with warm salad recipes as requested by many of my viewers. So now lets see how to make the best salad / good salad ideas /simple vegetable salad / pomegranate salad dressing recipes / veg salad. Place chopped cucumber, chopped carrot and chopped apple in a large bowl. Lightly season it with pepper powder, salt and apple cider vinegar. Then top it with pomegranate seeds and give a final mix. Plating is up to you and serve.